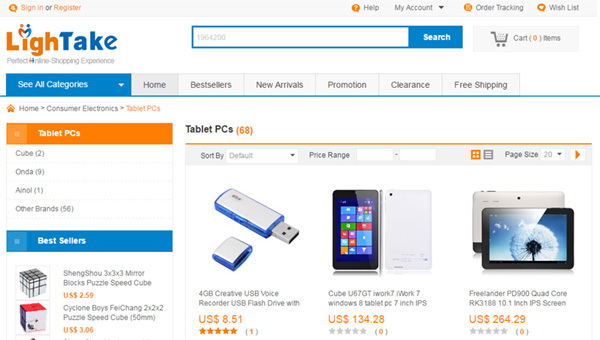 LighTake is a Chinese company that offers a wide variety of products from local manufacturers. Those products are: toys, fashionable clothing and accessories from popular Asian designers, electronics, and accessory components for PC, car electronics, GPS navigators and FM transmitters. You can also notice a great choice cellphones for all tastes, from quite simple to android smartphones here. The shop offers tablets and netbooks. You should pay attention to the fact that there are lots of toys and puzzles. The LighTake internet-shop delivers your purchases by airmail for free. If your order is over 15 USD the tracking service is also given for free. In case you need to receive your product in shorter terms it is possible to choose an express delivery using the DHL or EMS services for certain extra payment. In cases when the item has damages and the product is not of a big value the company may send you another one absolutely for free! And this fact cannot make you unhappy. If the product is rather pricy, the internet-shop will ask you to send it back to China and will undertake to pay 50% from the cost of delivery, which is a great fact as well! There is a system of points on the site. For example if your order is 100 dollars you get 10 points. Those points can be used while paying for the order – 10 points are equal 1 dollar. You can also earn some points. They are earned by, for example, writing an item review, filming a video that describes a product etc. You can learn all the details in the "Help" section on the LighTake webpage.